The present Conservative Government, like the Coalition Government that preceded it, has an ideological predisposition towards the market and its supposed benefits to consumers, but appears to have no vision of Higher Education and its benefits to students and to the whole of society. maintaining an independent platform for research into society and science to facilitate democratic debate. The last of these, sometimes drawn under the umbrella of ‘academic freedom’, is the basis of the historic contract between Universities and the State. We contend, following the UNESCO Recommendation (1997), that academic freedom must be sufficient to guarantee the independence of scientific inquiry, commentary and teaching. Pressures from funding agencies and the state are usually cited as the principal threats to academic independence. The last decade has seen the rise of a third threat, namely an increasing managerial interference in academic life deriving from the introduction of market imperatives. These three societal benefits are interconnected. Without independent research there can be no scientific independence and no cutting-edge teaching. Without a focus on critique and challenge, students may see ‘education’ as a mere process of accumulating ‘facts’ to meet test criteria. A narrow focus on the acquisition of qualifications undermines the education process itself. Employers have criticised graduate recruits for insufficient creativity, of being rote-taught and thus un-adaptable to a modern business subject to rapid technological change. Importantly, critical skills are necessary to meet the challenge of business and for inclusive democratic engagement. The idea of a University that unites these three aspects is undermined by a new model of Higher Education Institution that sees the investment in human capital only as a private benefit. The Government’s White Paper, Success as a Knowledge Economy, and associated legislative programme, consolidate a fee-loan (or debt-finance) model of funding which puts the costs of higher education onto new graduates and future taxpayers, while reducing taxes for current taxpayers – many of whom directly benefit from publicly-supported higher education, or from its wider public benefits. The Government suggests that it is merely replacing direct public funding with one that places the ‘student at the heart of the system’. But it proposes that public funding should be directed towards the realisation of the private benefits of higher education, and it fails to acknowledge the wider public benefits that higher education affords. In truth, the proposals place the market at the heart of the system and subordinate the student as a consumer of higher education, with loans functioning as a voucher to present at a university of choice (providing that the student has the grades required). It is our view that this new funding model is wrong in principle and deficient in practice. The regulatory framework that is being introduced in its wake will undermine the declared aims to improve teaching quality, to enhance social mobility, and to improve access and achievement. The extension of university title to for-profit providers will also threaten the wider public benefits of higher education, by allowing them to compete as single-function institutions, and giving them access to publicly-supported loans for their students without a guarantee of their longer term stability. This will intensify existing competition and encourage a ‘race to the bottom’. 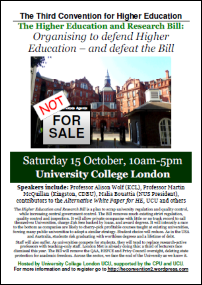 Our defence of an alternative vision of Higher Education takes place in the context of a dismal lack of leadership by the various mission groups representing universities in the sector – for example, Universities UK and the Russell Group – and other bodies responsible for the sector. Their willing advocacy of a fee-loan model of funding (to avoid possible cuts) has abdicated their leadership role in a proper debate on the values of public higher education. This failure to defend the values of the very public higher education they are chartered to provide is in marked contrast to representations made by another group. Lobbyists on behalf of for-profit providers are seeking a supposed ‘level-playing field’ in undergraduate degree provision, despite having no track record of success in the UK, a disastrous record in the USA, and no desire to provide any wider public benefit of their existence. This Alternative White Paper aims to correct this imbalance. 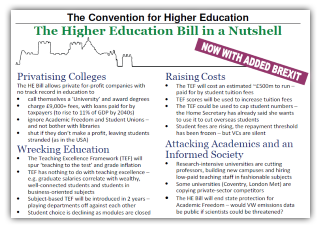 We need a proper debate about the future of UK Higher Education. This entry was posted in alternative white paper, Uncategorized and tagged alternative, higher education, white paper. Bookmark the permalink.